The performance of the Modification of Diet in Renal Disease (MDRD) and the Cockcroft-Gault (CG) equations as compared with measured 125I-iothalamate GFR (iGFR) was analyzed in patients with chronic kidney disease (CKD) and in potential kidney donors. All outpatients (n = 1285) who underwent an iGFR between 1996 and 2003 were considered for analysis. Of these, 828 patients had CKD and 457 were potential kidney donors. Special emphasis was put on the calibration of the serum creatinine measurements. In CKD patients with GFR <60 ml/min per 1.73 m2, the MDRD equation performed better than the CG formula with respect to bias (−0.5 versus 3.5 ml/min per 1.73 m2, respectively) and accuracy within 30% (71 versus 60%, respectively) and 50% (89 versus 77%, respectively). Similar results are reported for 249 CKD patients with diabetes. In the kidney donor group, the MDRD equation significantly underestimated the measured GFR when compared with the CG formula, with a bias of −9.0 versus 1.9 ml/min per 1.73 m2, respectively (P < 0.01), and both the MDRD and CG equations overestimated the strength of the association of GFR with measured serum creatinine. The present data add further validation of the MDRD equation in outpatients with moderate to advanced kidney disease as well as in those with diabetic nephropathy but suggest that its use is problematic in healthy individuals. This study also emphasizes the complexity of laboratory calibration of serum creatinine measurements, a determining factor when estimating GFR in both healthy individuals and CKD patients with preserved GFR. The current Kidney Disease Outcomes Quality Initiative (K/DOQI) guidelines advocate creatinine-based equations for estimating GFR to identify patients with potential kidney disease and to classify them into different stages on the basis of these results. These stages also include individuals with normal or near-normal GFR (1). Such stratification requires an accurate and precise measurement of GFR that is inexpensive, reliable, and widely available. Equations for estimating GFR offer a rapid method of assessing renal function in patients with kidney disease, but these formulas are limited by lack of validation in the full range of GFR to which they are applied. Common features of these equations are reliance on serum creatinine (SCr) and demographic and anthropometric data. The most commonly used formula was introduced by Cockcroft and Gault (CG) in 1976 on the basis of observations in predominantly hospitalized male patients (2). The original purpose of this formula was to calculate creatinine clearance, but it also estimates GFR with acceptable performance (3). In the Modification of Diet in Renal Disease (MDRD) study, patients with renal dysfunction underwent GFR measurements by 125I-iothalamate renal clearances (4). From these data, several equations were derived, including a four-variable MDRD equation that has been the most widely accepted and used (5). Later, they were validated in black individuals with hypertensive nephrosclerosis using information obtained from the African American Study of Hypertension and Kidney Disease (6). Because these studies enrolled populations of predominantly nondiabetic outpatients with moderate CKD, the applicability of the MDRD equation to other populations is unclear, including individuals with minimal or no kidney disease, those with more advanced renal dysfunction, and patients with diabetes. Validation of the CG and MDRD formulas has been attempted in individuals with known renal disease and normal SCr levels (7), patients with early diabetic nephropathy (8), and individuals without kidney disease (8–12). However, the different methods used to measure GFR and, more important, the uncertainty about the calibration in SCr measurements limit the interpretation of these results. This last issue is particularly important in individuals with SCr values in the normal range because minimal numerical variations in SCr will have a large effect in the final estimated GFR (13,14). The purpose of this study was to evaluate the performance of the four-variable MDRD and CG equations in two distinct populations: (1) outpatients with CKD, including those with diabetic nephropathy, and (2) healthy individuals. Our findings support the use of the MDRD equation in patients with moderate or advanced CKD but raise concerns about its applicability in individuals with normal GFR. More important, we also demonstrate the importance and complexity of the calibration of SCr measurements and how they adversely affect the clinician’s ability to interpret estimates of GFR in individuals with preserved kidney function. The Renal Function Laboratory at the Cleveland Clinic Foundation (CCF) performed approximately 9000 measurements of GFR by 125I-iothalamate renal clearance (iGFR) from 1982 to 2002 and maintained a database with demographic and laboratory variables. This report is limited to data on 1285 outpatients who were 18 yr or older, with or without CKD, and who had SCr values obtained between January 1996 and December 2002. Of these, 457 were healthy kidney donors (kidney donor group) and 828 had CKD (CKD group). A total of 249 individuals had diabetic nephropathy (DM subgroup), and 579 had other causes of CKD (non-DM subgroup). GFR was measured using the renal clearance of 125I-iothalamate as described by Israelit et al. (15). Patients received a water load before the test. Twenty-five μCu of 125I-sodium iothalamate (Glofil; Questor Pharmaceuticals, Union City, CA) was injected subcutaneously without epinephrine. Baseline urine and blood samples were obtained. A voluntary-voided urine sample was discarded, followed by two timed clearance urine collections. Blood samples were drawn before and after each urine collection. Isotope activity was determined by gamma counting of 0.5 ml of plasma or urine on a Packard Minaxi 5000 series counter (Perkin Elmer Life Sciences, Downers Grove, IL). The counts in each period were the average of the bracketed samples for each clearance period. The mean GFR was calculated from two consecutive clearance values, and the results then were corrected to standard body surface area (1.73 m2) (16). This is almost the same procedure used in the MDRD and African American Study of Hypertension and Kidney Disease studies (4,6). A blood sample obtained simultaneously with the iGFR was used to measure SCr by the modified kinetic Jaffe reaction, using a Hitachi 747-200 Chemistry Analyzer (1996 to 2001) or a Hitachi D 2400 Modular Chemistry Analyzer thereafter (Roche Diagnostics, Indianapolis, IN). Paired SCr measurements by the MDRD and CCF laboratories were compared for 89 College of American Pathology (CAP) samples obtained at 14 time points between 1996 and 2002. Values that fall within ±0.3 mg/dl or 15% of the mean SCr are considered by the CAP to be within an acceptable range (14). The mean SCr levels performed by the CCF laboratory of 411 kidney donors between 1996 and 2002 were also compared with the mean calibrated SCr levels in corresponding age, gender, and racial subgroups from the nationally representative Third National Health and Nutrition Examination Survey (NHANES III) sample of noninstitutionalized adults. The NHANES III mean SCr levels were based on 15,625 measurements calibrated to the MDRD laboratory based on measurements performed by the NHANES and MDRD laboratories of 554 stored frozen patient samples during 1999 (14). Agreement was evaluated graphically by plotting eGFR against iGFR and by use of residual plots (17). Bias, a measure of systematic error, was assessed by median difference and median percentage difference, and accuracy was evaluated by median absolute difference, median absolute percentage difference, and percentage of eGFR values that fell within 30 and 50% of iGFR. P values for comparisons of the agreement of eGFR with iGFR were obtained using the McNemar test for percentage of eGFR values within 30 and 50% of iGFR and the bootstrap method (using 400 independent replications) for other indices. The relationships between iGFR and the terms included as predictor variables in one or both of the equations were evaluated by performing multiple regression to relate log-transformed iGFR to log SCr, log age, log weight, 0 to 1 indicator variables for black race and female gender, and the product of log SCr with itself and with each of the other predictor variables. The product terms with SCr were included to determine whether the effect of any of the predictor variables depended on the level of SCr. Separate models were fit for the CKD patients and the kidney donors. The only product term to reach statistical significance in either the CKD patients or kidney donors was the square of log-transformed SCr (P < 0.001 for the CKD patients, P = 0.02 for the donors). Accordingly, for both groups, the final model included log SCr, the square of log SCr, log age, log weight, and indicator variables for race and gender. Similar regression analyses were performed to relate eGFRMDRD and eGFRCG to the same set of predictor variables. The estimated effects of each predictor variable on iGFR were compared with the corresponding estimates of the effects on eGFRMDRD and eGFRCG to determine whether the relationships of iGFR with SCr, race, gender, age, and weight agreed with relationships predicted by the two estimation equations. Changes in calibration of SCr over time within the CCF laboratory were investigated by performing regression analysis to obtain adjusted means of iGFR, eGFRMDRD, and the difference between eGFRMDRD and iGFR for successive 1- to 2-yr intervals between 1982 and 2003 after controlling for age, gender, and race. The SCr values obtained by both laboratories from the CAP samples were compared using a mixed-effect analysis to account for correlations in results for specimens analyzed at the same time point. Three scenarios were considered to evaluate the effect of a possible calibration error in SCr between the CCF and MDRD laboratories: (1) a constant calibration error ranging from −0.2 to 0.2 mg/dl over the full SCr range; (2) a calibration error concentrated at low SCr values, defined by assuming an error between ±0.2 mg/dl at a CCF SCr of 1.0 mg/dl; the magnitude of the error was assumed to decline linearly to 0 at SCr = 4.0 mg/dl and remain 0 for SCr >4.0 mg/dl; (3) a calibration error concentrated at high SCr values, defined by assuming an error between ±0.2 mg/dl at a CCF SCr = 4.0 mg/dl; the magnitude of the error was assumed to decline linearly to 0 at SCr = 1.0 mg/dl, and remain 0 for SCr <1 mg/dl. Figure 1 shows the adjusted mean differences between eGFRMDRD (based on the CCF laboratory SCr measurements) and iGFR after controlling for age, gender, and race. An abrupt increase of approximately 30 ml/min per 1.73 m2 in mean eGFRMDRD − iGFR occurred in the kidney donor group after 1996. A similar increase was observed at this time in eGFRMDRD (corresponding to a decrease in SCr) but not in iGFR, suggesting that the change was due to SCr measurements and not to changes in iGFR. A similar shift but of smaller magnitude occurred during the same period in the CKD group. Examination of records after detection of this shift suggest that the drift was related to the implementation by Roche of a “blank compensated” rate Jaffe method on the Hitachi 747-200 Chemistry Analyzer, giving significantly lower values for low SCr ranges. To avoid this complexity, the analyses of this report are restricted to SCr values obtained after 1996. Nonetheless, even after 1996, a statistically significant (P < 0.001) drift of up to 15 ml/min per 1.73 m2 in mean eGFRMDRD − iGFR was observed in the kidney donors. 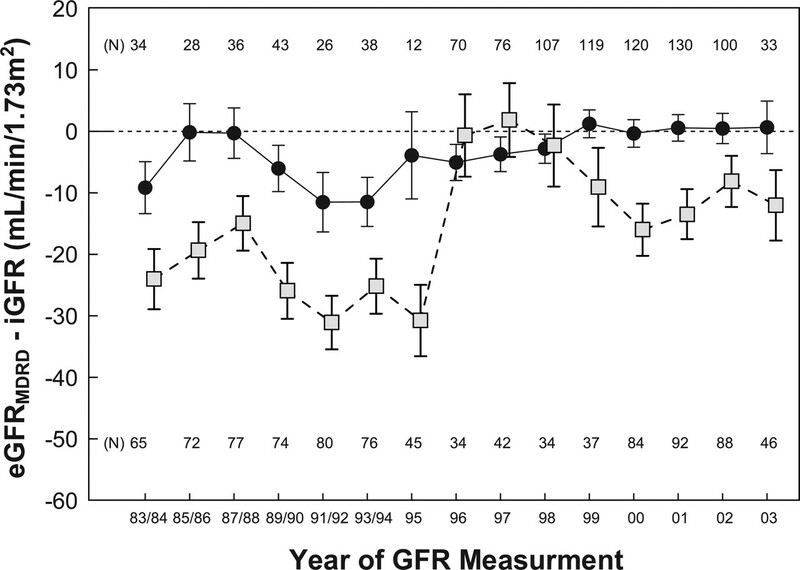 Mean difference between estimated GFR with the Modification of Diet in Renal Disease formula (eGFRMDRD) and 125I-iothalamate GFR (iGFR) from 1982 to 2003 for patients with chronic kidney disease (CKD; circles) and kidney donors (squares). An abrupt increase of approximately 30 ml/min per 1.73 m2 in mean eGFRMDRD − iGFR is apparent after 1996 in the kidney donor group with a similar but smaller shift in the CKD group. Similar results are obtained when eGFRCG is used instead of eGFRMDRD. Overall, the mean (±SE) SCr for the 89 paired CAP specimens was similar between the MDRD and the CCF laboratories (MDRD − CCF mean difference ± SE = 0.04 ± 0.02 mg/dl; P = 0.12). However, among 28 CAP specimens in which the average SCr for both laboratories was <2.0 mg/dl, the mean SCr was significantly higher for the MDRD laboratory (0.09 ± 0.03 mg/dl; P = 0.006), suggesting the possibility of a limited calibration bias at lower SCr levels. The extent to which the results presented in this study are dependent on the calibration is evaluated in the sensitivity analyses below. Table 1 summarizes the population characteristics of the study groups. The mean (±SD) iGFR was 32 ± 28 ml/min per 1.73 m2 in the CKD group and was higher among individuals without diabetes (36 ± 30 ml/min per 1.73 m2) than in individual with diabetes (24 ± 21 ml/min per 1.73 m2). The mean iGFR was 106 ± 18 ml/min per 1.73 m2 in the kidney donors. After controlling for differences in age, race, and gender, the overall adjusted mean SCr for the subgroup of 411 CCF kidney donors with age 20 to 59 yr was similar to the adjusted mean calibrated SCr from NHANES III patients in the same age range (0.83 ± 0.01 versus 0.81 ± 0.01 mg/dl). Table 2 provides indices of bias and agreement of estimation equations with iGFR, and Figure 2 presents the relationships between eGFR and iGFR in CKD patients and kidney donors. The larger Pearson correlations between eGFR and iGFR shown in Figure 2 for the CKD group than for the kidney donor group in part reflects the wider range of GFR among the CKD patients. Table 3 describes the agreement of the assigned K/DOQI categories between iGFR and eGFRMDRD. Association of estimated GFR with measured iGFR in outpatients with CKD (circles) and potential kidney donors (squares). (A) Association of iGFR with eGFRMDRD. (B) Association of iGFR with eGFRCG. Dotted lines subclassify the GFR on the basis of Kidney Disease Outcomes Quality Initiative stages. eGFR is plotted on the horizontal axis, and iGFR is plotted on the vertical axis. Figure 3 summarizes the estimation error defined by the difference between eGFRMDRD and iGFR when a given eGFRMDRD value is observed and is the standard statistical approach to displaying the accuracy of regression models such as the MDRD equation (17). Figure 3 indicates that kidney donors with eGFRMDRD <100 ml/min per 1.73 m2 tended to have eGFRMDRD values that were substantially lower than their iGFR values. Residual plot showing the distribution of errors in estimation of measured iGFR with eGFRMDRD when a given eGFRMDRD value is observed. 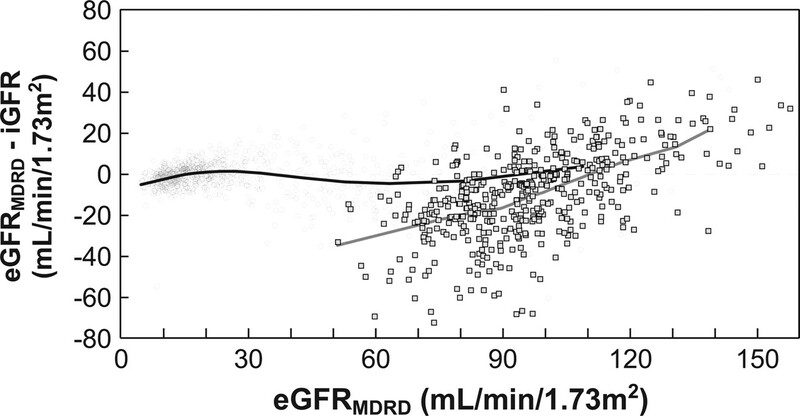 The MDRD equation tends to underestimate eGFR in kidney donors (squares) with eGFRMDRD <100 ml/min per 1.73 m2. Each of the indices in Table 2 indicates significantly better performance for the MDRD equation than for the CG formula in the CKD group. The MDRD equation provided approximately unbiased estimates of iGFR for individuals both with and without diabetes, and the advantage in accuracy of the MDRD equation compared with the CG formula was similar between subgroups. Reflecting a “fanning out” of the GFR values at higher GFR levels, the median absolute errors in the eGFR values were greater in the subgroup with GFR >60 ml/min per 1.73 m2 than among patients with lower GFR. However, the median percentage of absolute errors was larger and the accuracy indices lower among patients with lower iGFR levels. The CG formula overestimated iGFR in both subgroups throughout the whole range of GFR. Moreover, inspection of Figure 2 and Table 2 suggests that eGFRMDRD may underestimate iGFR at the higher GFR levels. In the kidney donor group, the MDRD equation significantly underestimates iGFR compared with CG (−9.0 versus 2 ml/min per 1.73 m2; P < 0.01), and the median absolute error and the median percentage absolute error were slightly smaller for the CG formula than for the MDRD equation. Table 4 summarizes the relationships of iGFR, eGFRMDRD, and eGFRCG to SCr, race, gender, age, and weight on the basis of multiple regression analysis. Because of the inclusion of a statistically significant quadratic term (see Materials and Methods section), the relationship of iGFR to SCr depends on the level of SCr and thus is summarized at two different levels for the CKD patients (1.5 and 5.5 mg/dl). Because the regression models have the same logarithmic form as the MDRD equation, the estimated effects of each factor on the eGFRMDRD are exact and correspond directly to the coefficients of that formula regardless of study population. We consider each term individually. (1) SCr: In CKD patients, the percentage increase in iGFR associated with a 10% decrease in SCr was greater at lower SCr values (nonlinear association). This contrasts with both estimation equations, in which the proportional effect of SCr is assumed to be constant for all SCr levels (linear association). In the kidney donors, a 10% decrease in SCr was associated with a much smaller increase in iGFR than predicted by either the MDRD or CG equations and also a much smaller increase than observed between iGFR and SCr among CKD patients with comparably low SCr levels. (2) Race: Among CKD patients, blacks had a mean iGFR that was 6.6% higher than nonblacks. This effect of black race was substantially smaller than the 21% predicted by the MDRD formula and somewhat more consistent with the CG formula, which included no race term. There was no significant effect of race among kidney donors, which as noted is inconsistent with the MDRD formula but consistent with CG. (3) Gender: In CKD patients, the observed 22.9% mean reduction in iGFR for women agreed more closely with the MDRD formula than with CG. Both equations seemed to overestimate significantly the effect of gender in donors. (4) Age: In both groups, the iGFR reduction associated with increased age was in general agreement with the MDRD formula but substantially smaller than the reduction predicted by the CG formula. (5) Weight: There was no significant effect of weight on iGFR in either group. This is consistent with the MDRD formula, which does not include a weight term, but is inconsistent with the CG formula. The regression coefficients relating iGFR to SCr and gender differed significantly between the CKD patients and the kidney donors (P < 0.0001 for each term), as did the full regression equations relating iGFR to all five terms (SCr, race, gender, age, and weight; P < 0.0001). As shown in Figure 4A, among kidney donors, the median bias of eGFRMDRD varied from a positive bias of 27 ml/min per 1.73 m2 if a constant negative calibration bias of 0.2 mg/dl is assumed between the CCF and MDRD laboratories to a negative bias of −30 ml/min per 1.73 m2 if a positive calibration bias of 0.2 mg/dl is assumed between the laboratories. However, a calibration bias of up to 0.2 mg/dl in either direction has little effect on the estimated bias in eGFRMDRD if eGFRMDRD is <30 ml/min per 1.73 m2 and a relatively modest effect if eGFRMDRD is between 30 and 60 ml/min per 1.73 m2. Figure 4B indicates a similar pattern if the calibration bias is assumed to be concentrated at low SCr values, whereas Figure 4C indicates little effect of a calibration bias of up to 0.2 mg/dl for all of the subgroups if the calibration bias is assumed to be concentrated at high SCr values. 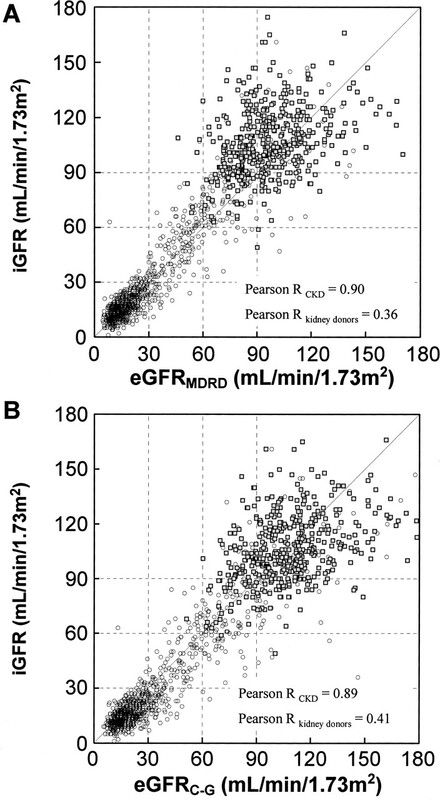 Analogous patterns were observed for other indices summarized in Table 2 and if eGFRCG is substituted for eGFRMDRD; results in kidney donors are highly sensitive to a small calibration error that was either constant or concentrated at low SCr values, whereas results in patients with GFR <60 ml/min per 1.73 m2 are only modestly affected by calibration errors of up to 0.2 mg/dl. The results in Table 4 pertaining to evidence of nonlinearity of the association of GFR with SCr and the effects of age, race, gender, and weight were largely unaffected by the levels of calibration bias considered in the sensitivity analyses. , individuals with eGFRMDRD 30 to 60 ml/min per 1.73 m2; □, kidney donors. The MDRD and CG equations are the most widely used formulas to assess renal function and have been proposed by the K/DOQI guidelines for the estimation of GFR (1). This study shows that the performance of these equations greatly depends on the population being evaluated. 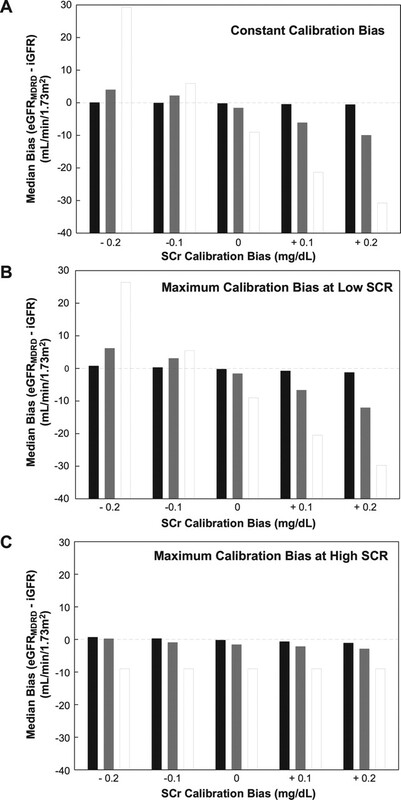 Using different approaches to verify SCr measurement calibration, this study confirms the adequacy of the MDRD equation in CKD patients, including those with diabetes, and its superior performance when compared with the CG formula in this population. However, neither the MDRD equation nor the CG formula adequately represented the relationship between GFR and SCr in kidney donors. The lack of systematic standardization of SCr assays is a determining factor when estimating GFR in individuals with normal renal function (18). We approached this issue by evaluating different methods to be reasonably confident that gross calibration errors were not affecting the interpretation of our results. We first sought to evaluate the existence of calibration bias within the CCF laboratory over time. As noted in Figure 1, an abrupt shift in SCr levels occurred between 1995 and 1996, affecting the estimation of GFR in kidney donors to a much greater degree than in CKD patients. Similar to previous work by Coresh et al. (14), this illustrates that calibration errors can greatly distort the interpretation of creatinine-based equations in the normal range of SCr. However, large SCr calibration errors between the CCF and MDRD laboratories after 1996 seem unlikely for two reasons. First, there was an overall good agreement between laboratories on the CAP samples (mean ± SEM = 0.04 ± 0.02 mg/dl). Nevertheless, the statistically significant difference between CAP samples with SCr <2 mg/dl and the subtle systematic drifts in mean eGFR after 1996 of up to 15 ml/min per 1.73 m2 in the kidney donors suggest the possibility of a small calibration bias. These “natural” drifts of SCr are likely to be multifactorial, constantly changing, and present in most laboratories (e.g., different batches of reagents, daily analyzer calibration, study population). Second, the overall mean SCr in the CCF kidney donors was similar to the mean SCr from the NHANES population. Sensitivity analyses suggest that calibration errors of up to 0.2 mg/dl have limited effects in individuals with GFR <60 ml/min per 1.73 m2 but could have substantial effects on estimates of bias and accuracy in individuals with GFR in the normal range (Figure 4). Therefore, the conclusions drawn for individuals with preserved GFR should always be accepted with some caution unless direct calibration of SCr assays has been performed. The MDRD equation was almost unbiased in CKD patients considered as a single group (median bias = −0.5 ml/min per 1.73 m2), and the multivariable analyses of Table 4 indicated close agreement of the CCF data with the gender and age terms in the MDRD formula. The CCF data were also consistent with the absence of an explicit weight term in the MDRD formula. Furthermore, although the MDRD formula was developed in a predominantly nondiabetic CKD population (4), it estimated iGFR with little bias and with greater accuracy than the CG formula in the diabetic CKD patients of this study. However, the CCF data indicate a smaller effect of race than predicted by the MDRD formula and a significant nonlinearity in the relationship between GFR and creatinine (a 10% decrease in SCr was associated with a 14.3% increase in iGFR at a SCr of 1.5 mg/dl versus a 8.6% increase at a SCr of 5.5 mg/dl), which is not indicated in either the MDRD or the CG formula. A distinctly different result was observed in kidney donors, in whom the difference in iGFR associated with a given change in SCr was severalfold smaller than in the CKD patients. This is probably a consequence of a narrower range of “true” renal function in the donors than in the CKD population. Given a relatively uniform level of renal function, differences in SCr between two donor patients are likely to predominantly reflect measurement error and nonrenal biologic factors. In contrast, among CKD patients, differences in SCr are more likely to reflect true differences in renal function and thus translate into larger differences in GFR. The different relationship of GFR with SCr in the donors versus the CKD patients indicates that one must use different estimation equations to estimate optimally the GFR in a predominantly healthy population than in a population in which CKD is known or suspected. Thus, both the MDRD and CG equations greatly overestimated the strength of the relationship between GFR and SCr in the kidney donors. The MDRD equation also underestimated the mean GFR by approximately 9 ml/min per 1.73 m2 in the kidney donor group. The estimated bias of the MDRD equation in this study is lower than previously reported bias estimates of 18.3 ml/min per 1.73 m2 (10) and of 29 ml/min per 1.73 m2 (11). However, neither of these studies calibrated their SCr values against the MDRD laboratory, and as demonstrated in the sensitivity analyses, apparent biases of these magnitudes may result from SCr calibration errors as small as 0.2 mg/dl. A similar observation was made by Rule et al. (11), who noted that the apparent bias in their study could be largely removed by adjusting their mean SCr by −0.23 mg/dl, the calibration difference reported between the NHANES III study and the MDRD study laboratories (14). In a recent report of a small number of kidney donors, Hallan et al. (12) were able to improve the performance of the MDRD equation by indirectly recalibrating the SCr values used to estimate GFR. Thus, the risk for calibration error precludes a firm conclusion from current data regarding the average bias of the MDRD equation in healthy populations. Nonetheless, the finding of a nonlinear relationship of GFR with SCr is not sensitive to calibration bias, and this nonlinear relationship is consistent with some degree of underestimation of GFR for patients with normal or near-normal renal function. It is interesting that the CG formula seems to be approximately unbiased in the kidney donors (subject to the above caveats regarding calibration bias). Because the CG formula was derived to estimate creatinine clearance, which is known to overestimate iGFR by 10 to 20% as a result of creatinine secretion (19), this may be interpreted as a fortuitous cancellation of errors. That is, the CG formula apparently underestimated creatinine clearance by 10 to 20%, thus producing a mean value close to the mean iGFR. This study emphasizes how various factors could affect the analysis and interpretation of the performance of GFR equations, especially the study population and laboratory calibration of SCr. We conclude that the MDRD equation is reasonable to use in patients who are known to have CKD, although it is possible that the equation may be improved slightly in CKD patients by incorporating a nonlinear relationship between GFR and SCr on the log scale. In healthy populations, both the MDRD and CG equations greatly overestimate the strength of the association of measured GFR with measured SCr. This is in part explained by the fact that the MDRD equation derived from a regression model from a substantially different population. These equations reflect the population characteristics from which they were derived; therefore, their use should be limited largely to individuals with similar characteristics. To avoid future dilemmas with respect to the universal applicability of an improved equation, a National Institutes of Health-sponsored study is currently ongoing with the purpose of developing a new equation derived from multiple databases along with extensive calibration studies to ensure generalizability throughout the whole range of GFR. We thank Dr. Vincent W. Dennis and Dr. Joseph V. Nally, Jr., for critical revisions of the manuscript, as well as Henry Rolin, Diane Pexa, and Gerald Roberson for implementation of the iGFR and data collection. E.D.P. is a recipient of a fellowship grant from the National Kidney Foundation. Portions of the data from this manuscript were presented at the American Society of Nephrology Meeting, San Diego, CA, November 2003. Clinical Decision Making in a Patient with Stage 5 CKD--Is eGFR Good Enough? Measured GFR as "Gold Standard"--All that Glitters Is Not Gold? Are the Creatinine-Based Equations Accurate to Estimate Glomerular Filtration Rate in African American Populations? The CKD-EPI Equation for Estimating GFR from Serum Creatinine: Real Improvement or More of the Same? Formula estimation of glomerular filtration rate: have we gone wrong? How Reliable Is Estimation of Glomerular Filtration Rate at Diagnosis of Type 2 Diabetes? Automatic Reporting of Estimated Glomerular Filtration Rate--Jumping the Gun? Small-Molecule Glycoprotein IIb/IIIa Antagonists and Bleeding Risk in Women: Too Much of a Good Thing?